Note: We recommend using PECARN over other pediatric head trauma rules, as it is the most widely validated. Do you use the Palchak Rule and want to contribute your expertise? Join our contributor team! Palchak MJ, Holmes JF, Vance CW, et al. 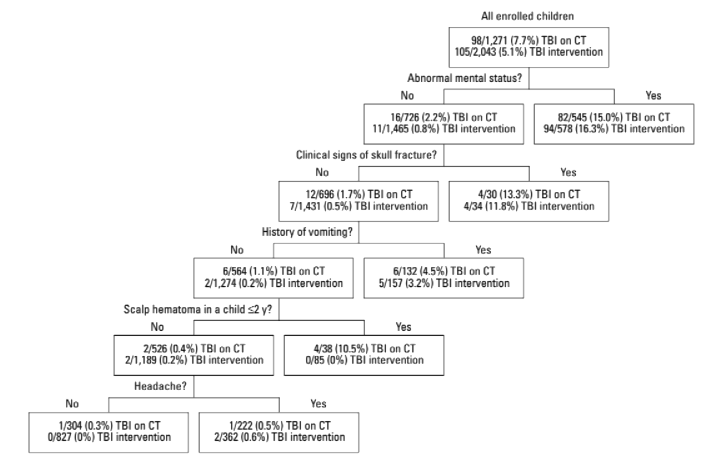 A decision rule for identifying children at low risk for brain injuries after blunt head trauma. Ann Emerg Med. 2003;42(4):492-506. Palchak MJ, Holmes JF, Kuppermann N. Clinician judgment versus a decision rule for identifying children at risk of traumatic brain injury on computed tomography after blunt head trauma. Pediatr Emerg Care. 2009;25(2):61-5. Michael J. Palchak, MD, is an emergency medicine physician at Sutter Davis Hospital in Emeryville, California. He has been in practice for 20 years. Dr. Palchak’s primary research interest is management of pediatric blunt head trauma. Nate Kuppermann, MD, MPH, is a professor and chair of the emergency medicine department at UC Davis Children’s Hospital. He chaired the first research network in PEM and was a founding chair of the Pediatric Emergency Care Applied Research Network (PECARN). Dr. Kuppermann is a leading national investigator for studies focusing on infectious emergencies in children including the laboratory evaluation of young febrile children, the evaluation of children at risk of diabetic ketoacidosis-related cerebral injury, and the laboratory and radiographic evaluation of the pediatric trauma patient.